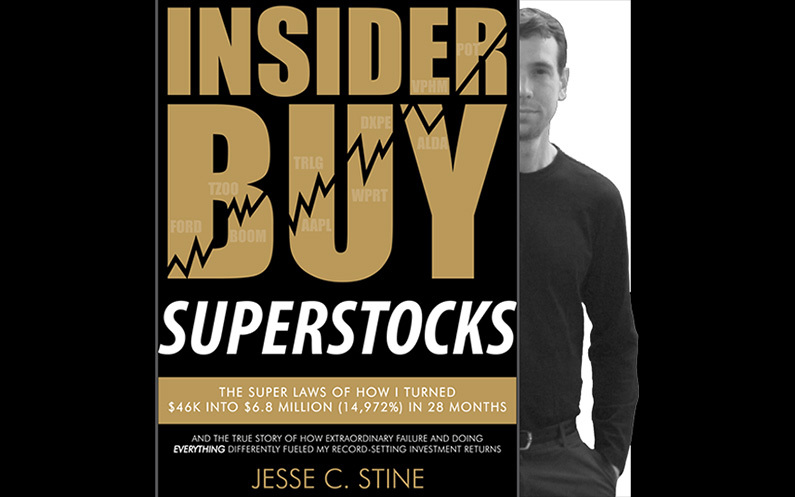 Jesse Stine is not the regular stock guru you see on the Internet selling services. Nope. And he’s not a hedge fund manager trading other people’s money either. Nope. Jesse Stine is an independent stock trader, just like you and me, trading his own hard-earned money. And Jesse Stine produced a mind-boggling (and fully audited) 14,972% returns in the markets, turning $46K into $6.8M… in 28 months. 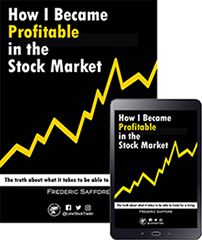 On top of becoming a self-made millionaire through his trading, Jesse also realized another dream of his a couple of years, which completely changed my life forever. 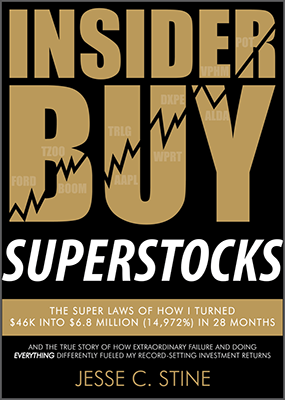 He wrote the book “Insider Buy Superstocks: The Super Laws of How I Turned $46K into $6.8 Million (14,972%) in 28 Months” in which he not only shares his life story, but also the trading strategy he used, as well as many invaluable lessons he learned through his 16 years of experience (at the time the book was publish, in 2013) as an independent trader. I’d like to now share with you 13 lessons I gathered from his book. If intelligence was the key to success in trading, there would be a lot more people making tones of money in the stock market. The truth is that emotional intelligence is much more important to succeed in the markets. You need to be able to master your emotions in order to follow your plan and not be tempted to buy or sell too early or too late. And being able to understand not only yourself, but also understand how other investors think, will give you an edge. If there is a Holly Grail in trading, or in any other endeavor, it is discipline. With discipline, you can achieve almost any goal. With discipline, you can study whatever you put your focus on, you can follow any trading strategy that has a positive expectancy and make money over time. But unfortunately, discipline is a very rare commodity. In trading, unlike any other jobs, you are on your own. No one will be there to remind you or force you to do anything. No one will take your hand and make sure that you learn what needs to be learned, that you to respect your stop loss, that you cut your losses short and let your winners run. The level of freedom we are faced with as traders is unlike anything most people have experienced in their lives. And if you lack self-discipline, it will be extremely difficult to succeed as a trader. Losses are just part of the trading game. Whether you are just starting, or you’ve been trading for 50 years and are the best trader in the world, you will suffer losses along the way. But the way you see losses and how you react to them will determine whether you’ll succeed or fail in the long run. If you can see losses as opportunities to learn, you will not only be less negatively impacted by them, but you will also put yourself in a position to continuously improve your trading and be on your way to trading success. The market, the news, social media, your broker, your friends, your level 2 quotes, and even your recent losses will constantly try to trick you into trading as much as you can. Successful trading though, is about being patient. It’s about waiting patiently for the trades that fit all the entry criteria of your strategy, and dismissing any other trades, even if you haven’t found any trade for a while, and even if you see some other stocks that do not match your criteria making big moves. And then, it’s about waiting some more for a sell signal, letting your trades run as long as possible, even when you are scared of losing your paper profits. In order to be more patient when in a position, Jesse recommends to step away from the markets during market hours. Once in a position, just delegate the decision making to your stop loss. By watching every tick, your irrational mind will start rationalizing and try to find meaningless reasons to sell. Media are money making businesses. If financial journalists actually knew what was going to happen, they’d be billionaires. They’re paid to write articles that appeal to the masses. Never forget that. Instead of being the sucker, understand that they focus on what has already happened and convey the general social mood, what the majority thinks. And when there is a very strong consensus in the market, very often, moves in the opposite direction are about to happen. Historically, market tops tend to occur at the point of maximum optimism, and market bottoms at maximum pessimism. This fact is very difficult to understand for new investors since they’ve always been taught to trust the media. Jesse recommends to only read headlines to gauge the social mood, and when there’s a very strong consensus, be prepared for strong moves in the opposite direction. I can’t count the number of times earlier in my career when I got scared by the general market and exited some individual positions right before huge moves, missing large profits. We all tend to watch the general market since all the financial news refer to the “market” as the Dow Jones and the S&P 500. But your job as a trader is to find the very best stocks, the ones that largely over perform the general market. The general market doesn’t reflect the performance of the very best stocks out there. You should not care much about it. Once again, let your stop do the worrying and take the unbiased decisions for you.